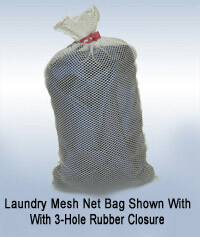 Mesh bag comes with heavy duty three hole rubber closure strap attached for easy closure of the laundry bag. Standard color is white. Other colors available: red, blue, green, yellow, purple, orange, black, gray, pink, brown, teal. For colors, add 10%. Two color bags can be made from any of these colors. Bags available with identification flags add $4.50/dozen. Industrial strength net bags used in commercial laundries can withstand high heat washers/dryers and industrial solvents.